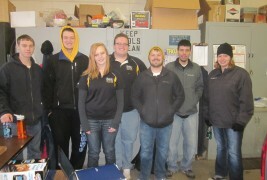 In late October, DSU Phi Beta Lambda hosted their annual Raking for Leaves charity event for the Madison community. This event consists of DSU students going around the Madison community raking lawns. Twelve lawns signed up ahead of time to have their lawns raked. The Student Senate and the DSU Gaming club volunteered four of their members each to come help Phi Beta Lambda with the charity event. This annual event is held every fall around late October to early November. The three clubs were each given four lawns to rake. Each lawn was ranked as either a small, medium, or large lawn. The clubs all had one large, one small, and two medium lawns to rake throughout the day. Volunteers were given water and granola bars in the morning and a free bagged lunch as a gesture of gratitude for their help. The event started at 8am and was officially done around 4:30pm that afternoon. Luckily, the weather was nice and sunny all day. The past few years it had been cloudy, cold, and murky. PBL thanks the Student Senate and DSU Gaming club for volunteering their time and helping to make the event run as smoothly as possible.